Are you among the thousands of women who wish they had stronger hair to try out beautiful hair styles? If so, don’t stress yourself! Thinning hair could be due to an underlying deficiency. If you have tried all types of remedies suggested by family and friends but nothing has worked, then try taking Biotin. Studies have shown that using biotin in the form of supplements or biotin enriched hair products can result in hair growth. So, if you are looking for genuine biotin supplements then you’ve come to the right place. Today we will review Biotin (High Potency) 5000mcg Per Veggie Softgel, a supplement that claims to support hair growth. Does it really work? Let’s find out. These soft gels contain 5,000 mcg of Biotin enriched with organic coconut oil for extra support. Biotin not only aids in hair growth but it also helps in converting carbohydrates and fats into energy. When we eat food rich in carbs, fat, and protein, our body requires biotin to break down the macronutrients present in these foods to convert them into effective sources of fuel. This helps in carrying out various physical activities with ease. Studies have shown that a daily intake of biotin rich foods or supplements not only promotes hair density by increasing the size of hair follicles, but also boosts nail strength and growth. Biotin (High Potency) 5000mcg contains Biotin as the main ingredient. It also includes other ingredients such as Non-GMO Plant Softgel (Vegetable Glycerin, Tapioca, Purified Water, Organic Bees Wax) and Organic Virgin Coconut Oil. 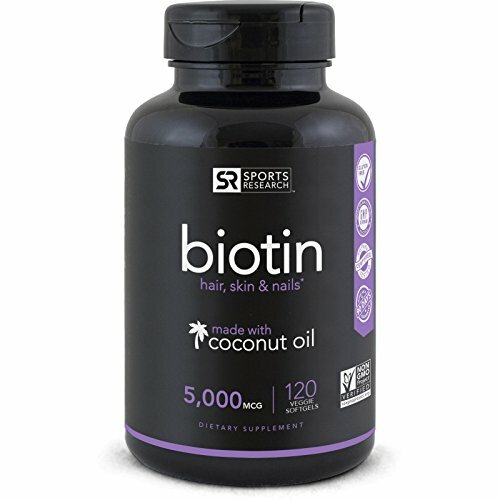 Biotin (High Potency) 5000mcg is formulated by Sports Research, a company that has gained immense popularity over the years for its wide range of certified supplements. The company has been offering a plethora of health supplements to help people lose weight, stay fit and lead a healthy life. Sports Research was the first soft gel company to create chewable products for weight loss. The team behind Sports Research is constantly searching for innovative ideas to create new products and develop their existing range. Biotin (High Potency) 5000mcg is one of their innovative formulas based on fast-acting soft gel technology that enables quick absorption of the nutrients. This product works from within to treat any underlying deficiency within your body. If your body does not have enough biotin, which is a rare case, your body will not receive the nutrients from the foods you consume. As a result, despite partaking in a healthy diet, you will experience a drop in energy level followed by thinning of the hair and your nails becoming brittle. This is an approved and verified non-GMO and gluten free product which means that it does not contain any form of preservatives, gluten, stearates or soy which are considered harmful for your body. The product is packed in state of the art facilities where they follow the highest standards to ensure that you receive checked and approved quality products. The product is enriched with coconut oil which further enhances its effectiveness. Coconut oil contains good fatty acids that supply natural protein to strengthen hair and prevent breakage and split ends. Coconut oil is rich in antioxidants and nutrients that are helpful in keeping the hair soft and supple. They also contain antifungal and antibacterial properties that protect hair and keep it healthy.. A study published in the “Journal of Cosmetic Science” in 1999, showed that coconut oil has the potential to reduce hair breakages. As mentioned above, Biotin (High Potency) 5000mcg also contains organic bee wax which is a natural ingredient that promotes hair growth. It also helps in thickening the hair strands so that your hair looks fuller, heavier and smooth. The product not only improves the condition of hair, but it also strengthens nails, eyebrows and eyelashes. Biotin is highly affordable and gives a good value for your money. However, please do not expect overnight results because it takes time to heal the damage and work on the deficiencies within the body. You can expect to see some significant improvement within 6 weeks. The 90 days money back guarantee is a powerful claim by the company. If a customer does not notice any improvement after using the product regularly for 90 days, he can return the product and ask for a refund. While the product is good for hair, some people may experience some side effects, especially if they have sensitive skin. If you experience sudden breakouts or skin inflammation, discontinue the supplements and consult a skin specialist immediately. 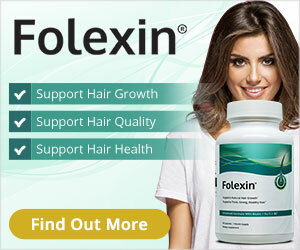 Overall, this is a good supplement for hair growth and the results are satisfactory. We love the 90-day money back guarantee which means there’s no risk involved for the customers. Highly recommended!